You’ve just finished a conference call and you decide to take just a couple of minutes before lunch to check in with Google Analytics (or Facebook or LinkedIn or Twitter). The next thing you know, you’ve glanced at the clock and over an hour has gone by. And, even worse, you have relatively little to show for your time. As a digital marketing agency, we get that. However, creating a simple strategy for your social media interactions is an easy way to avoid that wrong left turn into the cyberspace vortex and can keep your social media working hard for your business. 1. Think about what you want to achieve via social media. The same way you wrote out your business plan and yearly goals, brainstorm what you want to accomplish through your company’s social media efforts. What are your objectives? We suggest addressing at least these five objectives: build your brand, obtain new leads, drive traffic, increase sales and engage with your customer base. Who is your buyer persona? Revisit your buyer personas. This will help you nail down who you want to reach through social media. How will you measure success? Think about the results you are aiming for and ways to monitor your social media marketing strategy. Incorporating calls-to-action and landing pages can help you track your traffic. Then, allot about 15 minutes per week to track your data. 2. Make your blog the home base of your social media efforts. There it is again, that intimidating word. BLOG. But, if you want to stay in the good graces of the Internet king, Google, then you have to embrace it. Make your blog the centerpiece of your social media marketing strategy. This will be the place where you publish and archive your unique, quality content that you then blast out on your social media pages. And, over time, if your content is helpful and interesting, your fans will share it on their pages, too. Establish your blog and make a standing appointment with yourself to write. If writing isn’t your best skill and you can afford to, hire a good copywriter. Determine 5-10 categories of topics and keywords you want to address. This will support your other SEO efforts. Keep a running list of topics that address customer’s questions. This will ensure that your content is relevant, timely and interesting. Take a look at our other tips for blogging, too. Link, link, link. Incorporate inbound links into your blogs and consider including links to reputable third-party sites as well. This will both encourage readers to look around on your site and build your credibility, hopefully convincing them to buy your product. 3. Build social media interaction into your regular routine. Rather than responding to social media notifications and comments as they come in, schedule social media interaction for a few set times each day. Otherwise, you’ll likely become a victim of the Internet’s time-sucking super power. Use time that would otherwise be wasted. Can you check in with Facebook and Twitter via a mobile device during your commute? Or over coffee? 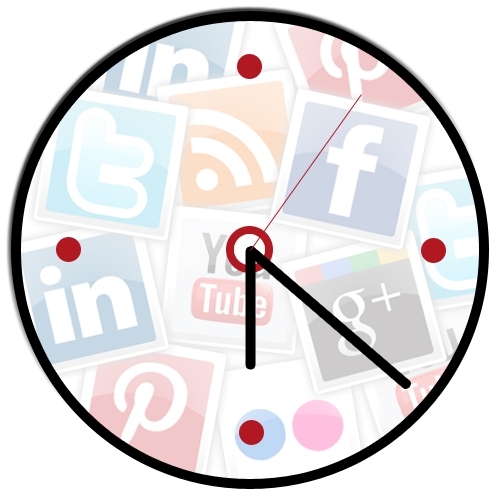 Set a specific time each day to share new information, such as your blog content. You can also respond to comments and comment on other pages. This should take another 15 minutes or so. Share your customers’ photos and images. Interact with your fans by featuring them on your page. Just make sure to ask permission. Let your customers know that you want to engage with them on social media. Place a conspicuous sign in your store, on your business cards, and in your e-mails. By building a few minutes at a time for social media into your routine, you can more efficiently manage your time on social media and analyze your results. What are some of your biggest challenges to utilizing social media effectively?